Hi guys, fishing is going quite well at present. Went out to Uretiti on dusk last week, picking up 7 snapper, all around the 4-5 pound mark. Two weeks ago we went across to Baylys Beach, and picked up 4 snapper and a swag of kahawai. I guess we can't complain about the fishing!! 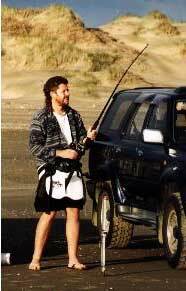 Remember last week when Wayne Moxham and Dave Stone who fish Waitarere beach said they always target change of light at night and leave the kite out for 2 hours. Well that is just what they have been doing again this week and Waiterere gave up yet another good sized fish. This one weighed in at just over 6kgs. Dave says "There's a fine line between fishing and just standing on the shore like an idiot"
Hi, I had the best time fishing the other day and caught the biggest fish I've ever landed (besides stingrays and sharks). 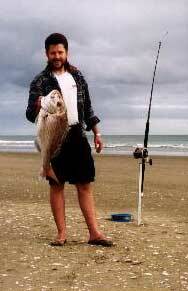 I fished at Muriwai up by the mouth of the Kaipara Harbour. Left : Mal with the results of the day on Muriwai. The photo shows a Super Kite, this is because the Flexiwing Kite is still attached to my rod and is back out there fishing. Most of the fish were caught on fresh kahawai. The following is the clubs fishing reports from their newsletter. Their last two newsletters will be posted on our site under club newsletters over the next few days. Three monthly competition sheets were returned from club members. 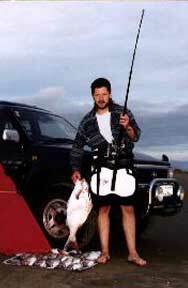 Robbie Cullen fishing at Glinks Gully caught 1 kahawai, 1 trevally, 1 gurnard, 1 shark and 16 snapper to 1.5 kg. David Billings also at Glinks, 6 snapper, 1 trevally and 1 gurnard. Kevin Griffiths at 90 Mile Beach on two occasions caught a total of 13 fish, the largest snapper being 2.5 kg. Kevin wins the monthly competition pin. The club competition day during March was held at Muriwai and 5 club members enjoyed a very good days fishing. A total of 25 snapper, 1 john dory, 11 kahawai and 5 sharks were caught. Eric Easton won the day with a magnificent snapper of 9.5 kg! 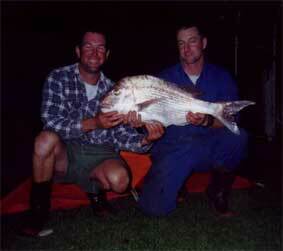 Other Meritorious catches included David Edlington 4.1 kg snapper and Tony Talbot 2.3 kg snapper. A demo day will be held on Sunday 19th May at the reserve off Kiwi Esplanade, Mangere Bridge. This will be a non-fishing day. The purpose of which will be to demonstrate kites of various types, setting up, tacking and related topics. A barbeque will be provided. This would be a great opportunity for newer members to see various kites in action and learn a few tips on using your kites from experienced club members. All members are welcome. Bring your family, your kites and a picnic. More info will be available nearer the time. In the interim, mark your calendars. George Coombes fishing at Muriwai Creek - everybody around him was catching fish but not George, and yes, he was using bait! Eric Easton caught a good haul of 1 - 2 kg snapper at Omaha on two occasions. It's worth a go, the fish are there. Robbie Cullen came across a couple in a campervan having a bit of trouble with their gear. It was in quite a state with hooks, traces and bait on the reel and wrapped around the reel axle. Apparently two naked ladies swimming nearby had distracted the winder. Peter Berry fishing from a boat at Port Waikato 1.5 km offshore reports no fish were showing on the fish finder, but there were plenty of kahawai mid water and snapper below. Forty one snapper were caught in an hour and small baits were working the best. Good snapper are coming in from the bar. Gurnard seem to be in close and snapper further out. David Edlington lost another kite at Pakiri trying to land a boat.